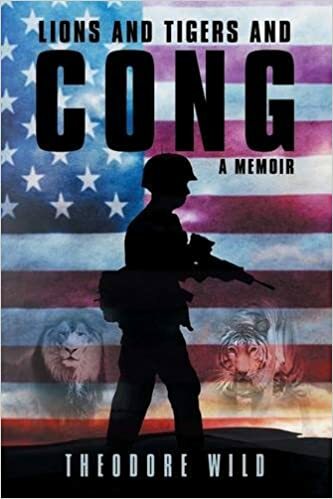 Theodore Wild’s Lions and Tigers and Cong (Lulu, 398 pp., $28.96, paper; $8.99, e book) describes a variety of places, people, and events in the life of a 19 year old in the Vietnam War as he grew from boy to man. Ted Wild served with Charlie Company in the 5th of the 46th infantry Battalion and later with Bravo Company of the 4th of the 221st Infantry, aka Big Bad Bravo. Wild’s title comes from his newbie’s briefing on what he would find in the jungles of Vietnam. 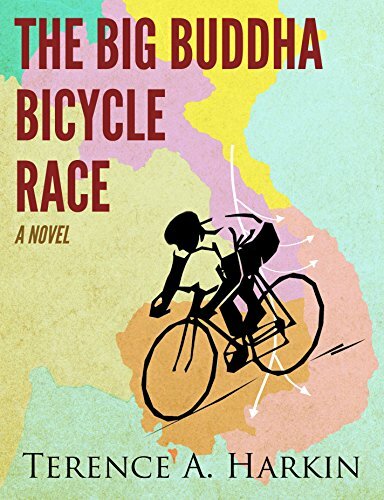 Terence A. Harkin’s The Big Buddha Bicycle Race (Silkworm Books, 446 pp., $6.99, Kindle) and its sequel, In the Year of the Rabbit, are set in Ubon, Thailand, where Harkin served with the U.S. Air Force’s AAVS Detachment 3 during the Vietnam War. He’s currently at work on his third novel, Tinseltown Two-Step, set in Los Angeles and Chiang Mai. Harkin, a life member of Vietnam Veterans of America, spent twenty-five years as a Hollywood cameraman. His time in the Air Force well prepared him for that job. Big Buddha is a work of fiction, but it often reads like a memoir of Harkin’s time in Thailand. He titles the book’s segment with dates such as “April 1970-March 1970,” and provides detailed place names, such as the 136th Photo Squadron at Norton Air Force Base, California, HQ of the Aerospace-Audio Base, California, Acronym AAVS, pronounced “Avis” in Air Force speak. The main character, Airman Leary, failed to read his USAF enlistment contract closely, overlooking the words “Needs of the Air Force,” so he ended up closer to the war than his recruiting sergeant said he would. As a result, the reader learns a lot about the real-life duties and experiences of airmen in a photo squadron. Airman Leary, a cameraman with the 601st Photo Squadron in Ubon, decides that it is a propitious time to put on a bicycle race “to keep up unit morale” because Nixon and Kissinger are going to visit. A bicycle race of “lovable Americans riding through the countryside to win Thai hearts and minds” would send a message to the world when featured in Life magazine and Stars & Stripes. There is some resistance from the North Vietnamese 599th Transportation Group so things don’t go quite as planned. It turns out that the race didn’t work well as a celebration of the war winding down—or, more accurately, as the war began to fail to wind down as promised. Where is that light at the end of the tunnel? Let’s pedal our asses toward it as hard as we can and see what happens. Harkin has come up with an enjoyable read. The book, however, offers more information about the workings of a Photo Squadron in Southeast Asia than any of us will ever need. Or want. We get some of the same popular culture references we’d expect from such a novel: John Wayne westerns, John Ford, Babe Ruth, and Muhammad Ali. But there also are some not so likely ones: Harmon Killebrew, Pinkie Lee, Guy Lombardo, Ernest Hemingway, Gertrude Stein, Suzy Wong, Wilfred Owens war poems and The Anderson Platoon. This is a perfect book for a movie lover to read if he also wishes to get credit for reading a book about our war in Southeast Asia. Did I mention that Airman Leary is a white kid from the Boston suburbs who is a drummer in a band and that he loves the music of Otis Redding, Solomon Burke, and Sam Cooke? That adds a layer of cultural meaning to the book. Probably the one thing this book does not need is another layer of cultural meaning. Consider it a bonus. 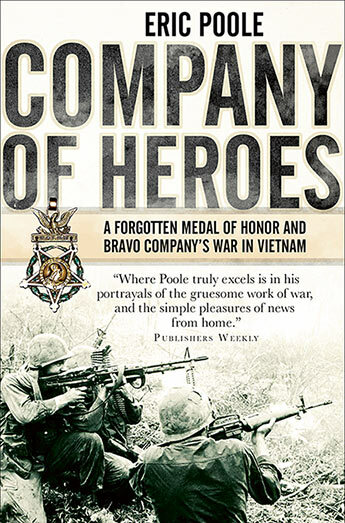 Eric Poole’s Company of Heroes: A Forgotten Medal of Honor and Bravo Company’s War in Vietnam, which Henry Zeybel reviewed on these pages when it was published in hardcover last year, is now out in paperback (Osprey, 320 pp., $15). The book tells the story of Spec 4 Leslie H. Sabo, Jr. of Bravo Company in the 3rd Battalion, 506th Infantry Regiment, 101st Airborne Division, Sabo received the Medal of Honor posthumously after nearly single-handedly fighting off a large enemy attack during the 1970 Cambodian incursion. “I believe that too many Vietnam War grunts never received the honors they earned. That is why books such as Company of Heroes are important,” Zeybel wrote in his review. On July 19, 1969, the North Vietnamese Army nearly destroyed Alpha 2/2 (Mech) of the U.S. Army’s First Infantry Division at Nui Ba Den mountain near Tay Ninh. American generals made bad decisions based on false assumptions resulting from faulty intelligence that led to the disaster. 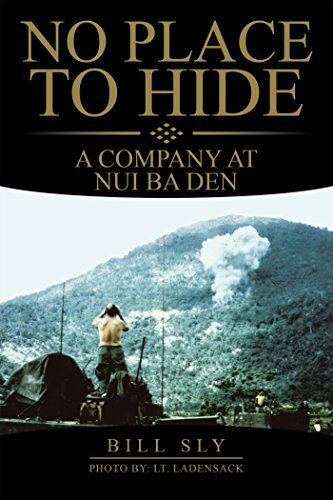 Bill Sly discusses these events in great detail in No Place to Hide: A Company at Nui Ba Den (iUniverse, 182 pp. $13.99, paper; $3.99, Kindle). Sly served as the 2/2 historian after time in the field as an infantryman. He bases most of his reporting on interviews with survivors of the attack on the mountain. Nui Ba Den (Black Virgin Mountain) rose to nearly a thousand meters and spanned a mile in width. The United States Army controlled the top and the perimeter around the mountain’s base, but the Eighty-Eighth NVA Regiment controlled everything in between. Plans called for 2/2 to scale the mountain, much in the manner of the taking of Hamburger Hill, while another American unit attacked from the top. From there, planning disintegrated. Under temporary command of the 25th Infantry Division, the men of Alpha 2/2 were ordered to dismount from their vehicles and advance on foot, a decision that violated unit-level training. Furthermore, dismounting contradicted Vietnam War armored warfare tactics, which Sly explains. According to survivors, a 25th general said, “I want a body count,” and sent 2/2 up the mountain—without support from the unit on top. The men walked into a trap. Finding themselves in open terrain and under highly concentrated fire from an enemy that held the high ground, the men of 2/2 made great sacrifices for each other as they split into smaller and smaller groups. They fought all day to extricate themselves from the area. The following day survivors with help from Charlie Company again went forward to recover bodies. In the two-day encounter, Alpha had nine men killed in action and forty-four wounded. Charlie had two KIA and four WIA. The Stars and Stripes portrayed the battle as a great American victory, which upset the participants. And then, Sly says, the battle appears to have been forgotten. (I searched internet but found no reference to it.) No Place to Hide is Sly’s contribution to setting the record straight. The book also provides one more reminder of American Vietnam War folly for taking or securing terrain, regardless of the cost, only to eventually abandon it. Sly writes from the heart. With a calm certitude, he validates the valor and fellowship of the men of Alpha 2/2. He neither editorializes nor pontificates in recreating two days of drama. Although he was on the scene in 1969, many of his endnotes refer to telephone conversations and letters dating from 1995. His research and the conclusions that he offers present valuable combat lessons. Jim Carmichael is a Marine who served a combat-heavy thirteen-month tour of duty in Vietnam in 1967-68. 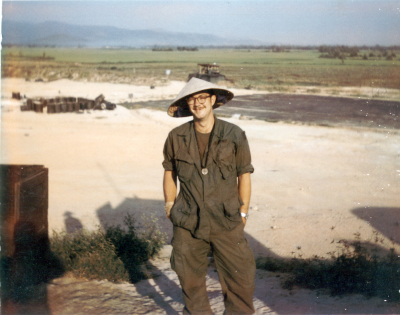 He survived the 1968 Tet Offensive and spent seventy-seven days at Khe Sanh. He was diagnosed with PTSD in 1997. A Long Healing Come Slowly: A Novel about PTSD and its Effects on Suffering Individuals and their Families (LifeRich, 536 pp., $44.95, hardcover; $33.99, paper) is his Carmichael’s first novel. He intends to write a sequel. The Preface describes this book as a fast read which it really is not. It is a large book that gives the history of multiple generations of a family with much involvement in America’s wars. Also, the book has some axes to grind. For instance, the author claims that “This country is also rapidly outlawing the mention or open display of God or his Law.” If our country has, I’ve failed to take notice of it. In a nutshell, this novel, Carmichael tell us, is about “a family living with a veteran who has PTSD.” That is no lie, and the author totally nails what that is like, missing no nuance in describing it. He traces the origins through multiple wars as the book’s veteran characters are still alive and involved in the family. Novelists have that control. The veterans in this novel have experienced and survived, sort of, the worst of America’s modern wars, including the Bataan Death March, and they are available and willing to testify about their trauma. Spoiler alert: I was shocked when the novelist killed off his main character. I sat and pondered and reread the chapter to make sure that it really happened. First time for me to get hit with that in a Vietnam War novel. A member of the Greatest Generation shoots himself with his pistol. He was one of those veterans who came back from World War II and chose to work his demons to death by making a good life for his family. I am familiar with that method as that was how my father dealt with his Iwo Jima Marine Corps demons. Repression and demanding control and a smooth peaceful life. Until his war came home. His wife thought the war was over. But was it? This novel makes the point that the war is never over. The military was not into anger management, so veterans had no idea what to do about their anger. Then the real cost of war becomes apparent. And often veterans are thrown to the wolves. Prison is full of them. So are cemeteries. This is an engrossing novel and I look forward to the sequel, which will, I hope, address the many loose ends left hanging at the end of this book. Carmichael has done a superb job of showing how a veteran with PTSD can masquerade as a perfect family man, and how his cover can get blown by a disturbing incident and knock the whole apple cart of a perfect American family totally out of kilter.